I had my Silhouette Cameo out for another project and thought I'd make some fun spiders while I had black paper running through the machine. My card background is made with the new October Afternoon paper line, Witch Hazel. LOVE IT! And that border at the bottom? I just discovered Impression Obsession dies. Oh my. I LOVE THIS die. And it comes in a set - so what could be better? I am entering this card in this week's challenge over at The Sweet Stop. You can play along too. Just take a look at Sketch #SSS178 on their website. Then make a card to submit. Easy peasy! I'll be back tomorrow with a fall card to show you. What a fun card Susie. 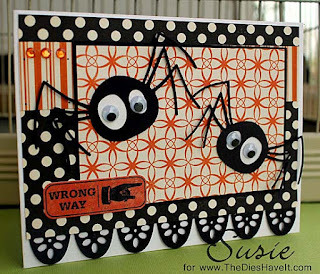 Love those spiders! The googly eyes look perfect. Aslo like the papers. Thank you for playing along with us at The Sweet Stop this week.